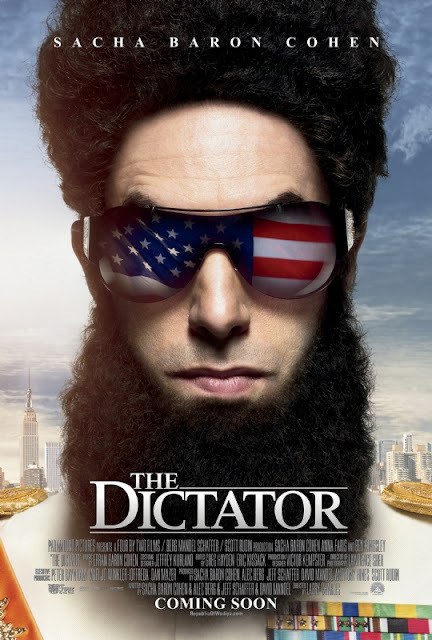 Second trailer for 'The Dictator' directed by Larry Charles and starring Sacha Baron Cohen, Anna Faris, Ben Kingsley, Megan Fox, John C. Reilly and J.B. Smoove. Supreme Leader Shabazz Aladeen gave a great gift to the world when he decided to be born. He was seventh son of the glorious Wadiyan President-For-Life Omar Aladeen. His mother was an Air France stewardess who tragically died of an oxygen underdose shortly after Aladeen’s birth in 1982 – this fact means he is now 30 years old. Any photos you may have seen of Aladeen as a child in the mid-70s, including a great one of him at the premiere of Saturday Night Fever, were doctored by the corrupt Zionist Western media. 'The Dictator' opens May 11 for the US, 18 May for Ireland and the UK.